School is out. Summer is here. The days are filled with kids traipsing in and out of our home. Trips to the library. Walks and chats with my son. Extra-long cuddles. Cloud-gazing. Lazy days. Full days. Days filled with endless sunshine and seagulls swooping in the skies. My little kitchen is humming. The dishwasher is running extra cycles. There always seems to be hungry kids hanging around waiting to be fed. One of my most favourite things in the world is to cook. And to eat. And to have a gathering of big and little people around our table. I grew up in a home that was always open to guests and we could always squeeze in an extra place at the table. I am thankful for having seen the spirit of warm hospitality in our home. One of my most favourite childhood memories is of me helping my dad in the kitchen at the weekends. Dad was a self-declared cook and somewhat of a legendary culinary expert in our family. And every weekend, he would take to the kitchen as chef and I was his very self-important little sous chef. The kitchen was where I discovered the stinging heat of chillies. And the sense of proud accomplishment in completing the tedious and stinky task of shelling a mountain of shrimps. That was also the time when I almost sliced off my thumb while grating a carrot. Poor Dad carried me and ran about in circles in a wild panic. I learnt some indispensable life lessons from the kitchen. Good times. My nine-year old son has always loved hanging out with me in the kitchen. Even from his earliest childhood. Dipping his finger into sauces. Giving his nod of solemn approval as he tasted a dish. Blowing carefully at each spoonful just to be sure it didn’t lack anything. Learning the names of spices and the faraway lands where they came from. Sniffing at bunches of herbs. Helping me to stir the pot. Watching a pie bake and bubble in the oven with utmost excitement. Cutting cucumbers and slicing tomatoes with the deep and careful deliberation of a child. It seemed like just a little while ago, his soft, chubby hands were happily playing pat-a-cake on a floury dough in the kitchen. And now he’s making lunch for the family. Time flies. 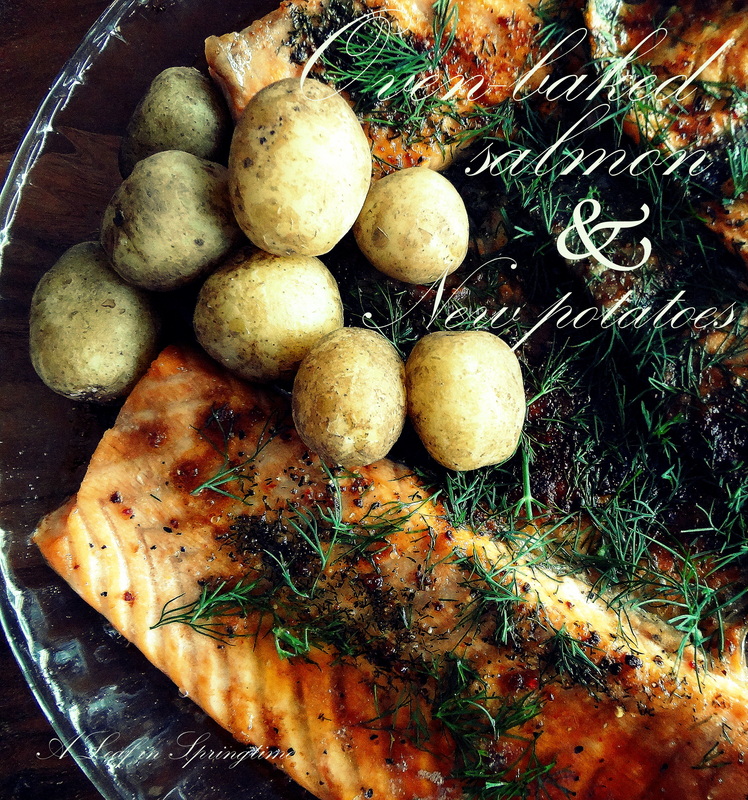 This is the Boy’s recipe for the oven-baked salmon with new potatoes and fresh dill. An all-time Finnish summer food. With a little twist of fusion since we are a fusion family. All done in 10 easy steps! Happy summer everyone! 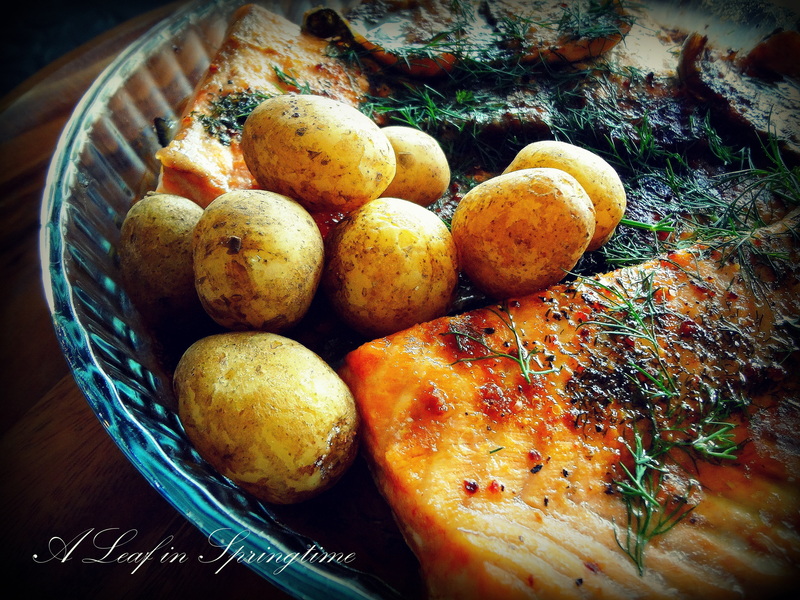 Place salmon fillets on a baking dish. Squeeze a full lemon over the fish. Sprinkle some Himalayan salt/sea salt. Drizzle some coconut oil on top. Pop it into the oven to bake at 200 degrees C for 20 minutes or until fish is cooked. Remove from oven and glaze some Teriyaki sauce on fish. Snip fresh dill over fish. Serve with a simple fresh salad or brown rice. Enjoy this recipe with your child this week. All food made with love is the best sort of food. P.S. If you would like to check out more recipes from the Boy, they’re on my Facebook page. “While they are at your side, love these little ones to the uttermost. Forget yourself. Serve them; care for them; lavish all your tenderness on them. Value your good fortune while it is with you, and let nothing of the sweetness of their babyhood go un-prized. Not for long will you keep the happiness that now lies within your reach. You will not always walk in the sunshine with a little warm, soft hand nestling in each of yours, nor hear little feet pattering beside you, and eager baby voices questioning and prattling of a thousand things with ceaseless excitement. What a wonderful memory for you and your son! What a delight to share your kitchen and your passion for food with your son. Simply beautiful 🙂 that quote at the end made me a bit weepy. Beautiful lunch – and beautiful post. Thank you for sharing your heart so eloquently and reminding me how fleeting is the time we have with our children. How precious is this! I’m looking forward to trying it myself! I can imagine the lovely and loving bustle of the children in your kitchen and the holy memories you give them daily with all those delicious foods and wonderful smells. When I recall my childhood’s sweetest times, they’re always with family, and usually in my parents’ or grandparents’ kitchens. This is a delicious idea for dinner, too; thank you! Blessings on your mid-week! Oh I love those cookbooks! I have Saraban and marvel at how beautiful it all is. Have you tried the chicken, celery and saffron dish? It’s so gentle and soothing. Will let you know 🙂 I know what book I will be reading tonight now! Sharon what better way than to create beautiful memories through food. Your son has a gift and I’m sure you will nurture it. Kath. Some of the most profound moments of a person’s life happen gathered around a table. In my mind, there is something truly sacred about sharing a meal and our hearts at the same time. How wonderful that you and your son share a love of food preparation. The meal he prepared looks delicious. We went out for a family lunch yesterday – quite a rare occasion – and it is a very special event with good food and lots of smiles. I despair at what seems to constitute childhood these days. Far too many engrossed in a tiny screen. The kitchen is a much better place. Totally agree with that Andrew! Children are sucked into a world of technology and are robbed of experiment true childhood innocence and memories. I love my childhood kitchen memories, too. It’s so lovely to read how you are nourishing your son on your own memories and helping him to create his own. His salmon meal looks so good. The strange thing is that as we age, we will find our children helping us in the kitchen in the same way that we helped them as youngsters. Love this article! I was particularly fascinated by your memories with your father in the kitchen, since I never had memories like those of my own. However, the way you narrated it helps me to imagine such tender feelings and fond memories vividly, and I’m touched at how you also transmitted that same love to your children as well. Thank you for writing this, Sharon! I love to eat too, and I will stay tuned! Moido! Compliments to the cook, this recipe sounds wonderful! Looks so delicious! I will have to try your recipe. What a sweet memory of you and your father. And, your son is so adorable helping out and tasting the sauces/dishes. Yum. This recipe looks delicious. What a wonderful passion to share with your father and now your son. So happy you are back writing in this place. Hugs. Sounds like you have quite the son! Almost makes me feel bad as a 20-something that I have never cooked a complete meal before. But hey it’s never too late to learn and start right? This salmon looks amazing. I will definitely put it on my list to try to make for the future. This is alluring. Just love to read your post. If somehow cheer me up when I am down. Thanks Sharon for such a wonderful and meaningful post. I really need to update my blog when I get my things done. Nice to hear from you. Love this poem, and your delightful reflections on the joy found in kitchen adventures. Just beautiful. This is so beautiful. I love that you and your son share a love for cooking. I hope (and imagine) my daughter will grow to share my passion for food and cooking as well. The poem brought a tear to my eye. It’s just beautiful. Thank you for taking a moment to look at my blog. I’m just getting starting and learning the tricks and the trade of the blogosphere. I look forward to reading more of your posts. You have chosen such a endearing subject here 🙂 love it..
As always, your words bring so much joy and pleasure to read. I read this standing in the kitchen, downing my favorite fast food. Ebly a French grain (barley or something) which I added to fried spring onions cooked in butter and chicken broth. It is one of the very easiest comfort foods. I loved reading your post and can’t wait to read it again. But as always your posts, and the lovely passages you share take more quality time to think about and answer. Printing out this wonderfully simple recipe.